At last, page 6! Celephais is now half finished, and I’m going to try to get back on that once-every-two-weeks schedule. This page actually needs more tone values and spot blacks, but I decided to put it up now as-is and come back to it later to add more depth. I cut out a bit of dialogue that could have been on this page, but hopefully I didn’t remove anything essential to the story. (I don’t think I did, anyway.) Anyone who’s read my adaptation of The Dream-Quest of Unknown Kadath will recognize a character or two here. I could’ve filled an entire page drawing the first panel. This scene makes me think of Italo Calvino’s “Invisible Cities,” which obviously depicts locations on the borders of the Dreamlands. The trip on the hot air balloon is my favourite part of this page. I really love the look of that old fellow who’s floating in the air and reading a book. I had been doing all my spot blacks with the same ballpoint pens I use for everything, but for this page and some of the previous page, I did them on computer after scanning the outlines. I’ve definitely got to add more blacks to this page. Once I get it on the computer, the temptation is to just add gray tone colors instead of spot blacks, because it’s faster, but I think the spot blacks usually look better. Yes, please add more luscious blacks! Although, as I noted before, your tonal shading is outstanding. The first panel is so full of life and detail you can almost see it as an animated sequence. 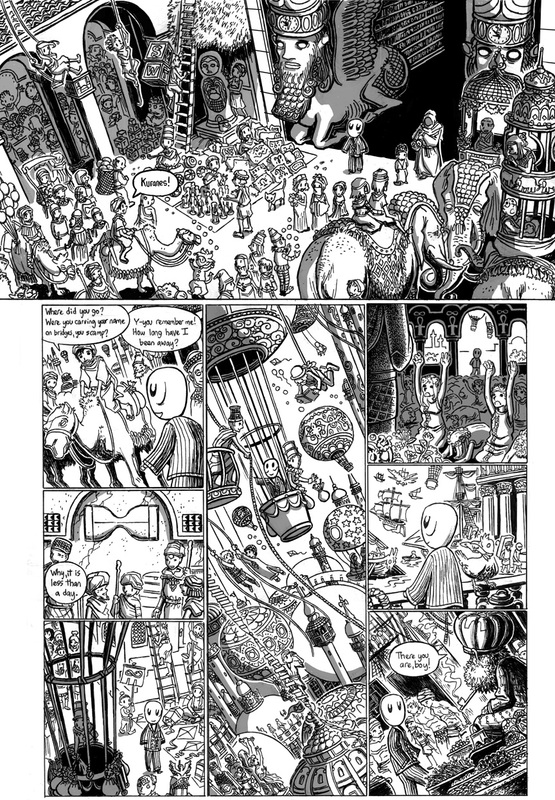 More wonderful bits: the ‘stilled’ hourglass, the standard bearing the moebius strip, the character toting the alphabet blocks up the ladder, the ‘double-decker’ howdah, the cat wandering by the pillow vendor, the scythe (the lone ominous note)…again, I can see the Tim Kirk influence.